It has been really hot for over a week now. I am attempting to find different dishes to make for dinner that will not heat up the kitchen. Today’s attempt, Salade Niçoise. This is more of an assemblage of various components rather than an integrated dish. I have no idea why it is famous. Key components are tuna, hard-boiled eggs, haricot verts, and potatoes. My least favorite ingredient was the tuna. I bought fancy Italian oil-packed tuna but it was pretty meh. Honestly I would have been happier with a bunch of chickpeas instead. The eggs came out the best, no green around the edges and just cooked through. I managed to get the shells off without destroying the eggs! It was not a very exciting dinner but John seemed to like it so maybe I am just too picky! 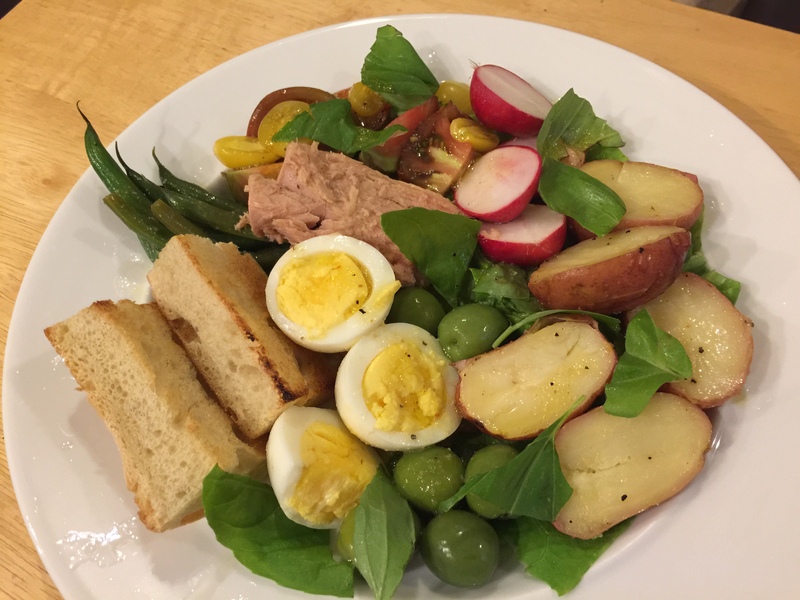 This entry was posted in Eggs, Fish, French, pescatarian, Vegetables and tagged green beans, hard boiled eggs, new potatoes, olives, radishes, Salad, Salade Niçoise, tuna. Bookmark the permalink.